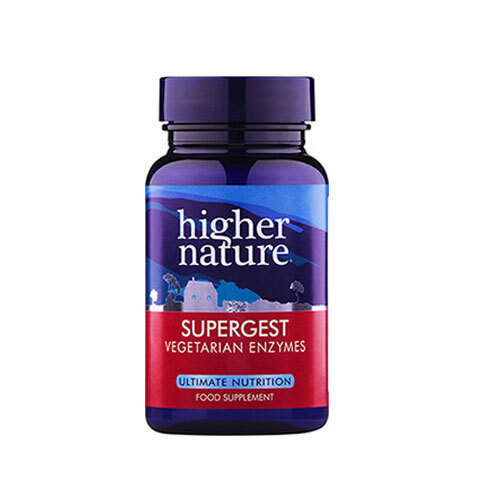 Supergest provides an even better spectrum of vegetarian enzymes to help maintain the digestive system and may aid the digestion of proteins, carbohydrates, fats, milk and cellulose. Many of the digestive enzyme products on the market today contain enzymes derived from animal sources, such as the pancreatic tissue of pigs. However, vegetarian enzymes, have several advantages when compared to animal enzymes. Vegetarian enzymes can be concentrated more than animal enzymes, so more activity can be included in each dosage unit. This means vegetarian enzymes require significantly fewer capsules or tablets per dose than animal enzymes to provide equivalent digestive action. Vegetarian enzymes can also help the body support a healthy digestive process. The most commonly used animal enzymes are most active in the alkaline environment of the small intestine (pH 7.2 to 9.0) after the body has already produced enzymes to complete digestion. Vegetarian enzymes, on the other hand, are active over a broad pH range (pH 2.0 to 11.0), so they are able to begin digesting food immediately after it enters the stomach. In addition, vegetarian enzymes continue to assist in digestion through most of the digestive tract. Vegetarian enzymes also provide a broader spectrum of digestive enzymes that act on all of the main food components (protein, carbohydrates, fat and fiber), whereas animal enzymes focus predominately on the digestion of proteins. Protease, vegetarian capsule: hydroxypropyl methylcellulose; fenugreek seed powder, ginger rhizome powderm fennel seed powder, amylase, invertase, glucoamylase (preservatives: sodium benzoate, potassium sorbate), bulking agent: rice bran; lipase, peptidase, diastase, xylanase (preservative: potassium sorbate), cellulase (preservative: sodium benzoate), lactase. Adults: Take 1 - 3 capsules a day, one with each meal, or as your health professional advises. If taking 1 capsule a day, take with a main meal. Children over 8 years: Take 1 capsule a day with a main meal, or as your health professional advises. Store in a cool, dry, steam free environment, out of reach of children. 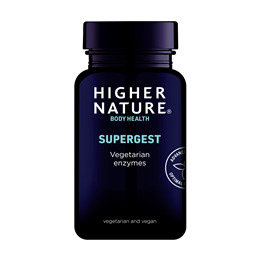 Below are reviews of Supergest - Vegetarian Enzymes - 30 Vegicaps by bodykind customers. If you have tried this product we'd love to hear what you think so please leave a review. I need digestive enzymes to help with several digestive issues and I've chosen this because I trust Higher Nature to produce the best. This is an excellent supplement. I find it's particularly good to use when eating out, to help with the digestion. Supergest use PET packaging which is reckoned to be superior to the HDPE packaging used by many manufacturers, and it's much lighter than glass which is heavy when travelling. The container is dark blue coloured to prevent spoilage by excessive light. Add to this vegetable base and competitive pricing means that Supergest have got it right for me.